This article is about the summon stone. For the Rotating Showdown, see Sagittarius Showdown. 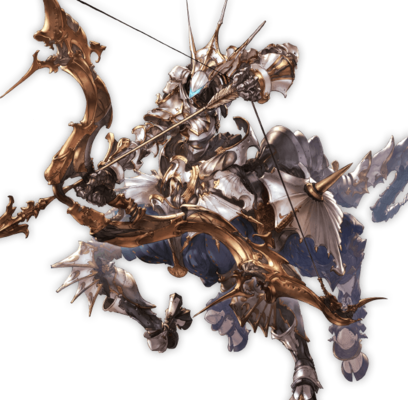 For the Xeno Clash event, see Xeno Sagittarius Clash. Saggitarius sounds his hooves on the black canopy, nocking his sorrow to the bow of wisdom. The shockwaves from single arrow can beget a world of devastation. 50% boost to Wind Elemental ATK. Duration: 4 turns for 4 turns. 9T9 turn cooldown. This page was last modified on 3 February 2019, at 18:23.